Itâ€™s time you got a better grip on your balls. No, not those ones. 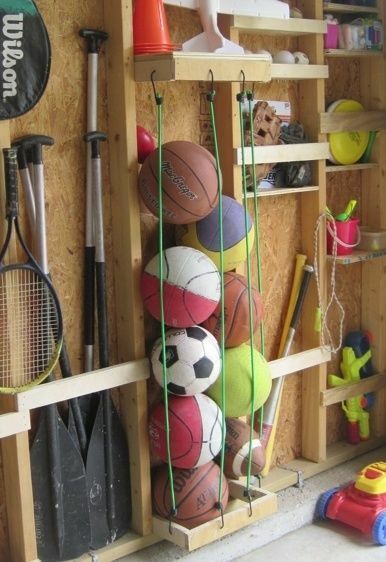 We mean the footballs, basketballs, and volleyballs scattered all over your garage. Build one side of the frame by making a rectangle with the 4-foot and 2.5-foot boards, using two deck screws at each corner. Repeat to build the second side. Screw the 1.5-foot boards to the inside corners of one the rectangular frames, using two screws at each corner. Repeat with the other rectangular frame. Drill Â½-inch holes with your wood-boring bit across the top and bottom of your frame, making sure that each hole is spaced 6 inches apart. Stretch the bungee cords, top to bottom, across the frame. Optional: Attach bin to your garage wall using 4-inch screws. Make sure you anchor the structure to studs.